In the years past since a true 2d Castlevania or Metroid title has graced a console, independent developers have taken it upon themselves to breathe new life into the genre and add their own complex quirks. It’s difficult to balance a proper sense of exploration with action to match but the team at CreSpirit might have stumbled upon the right formula. Sometimes it takes a bunny to do a man’s job and save the world. 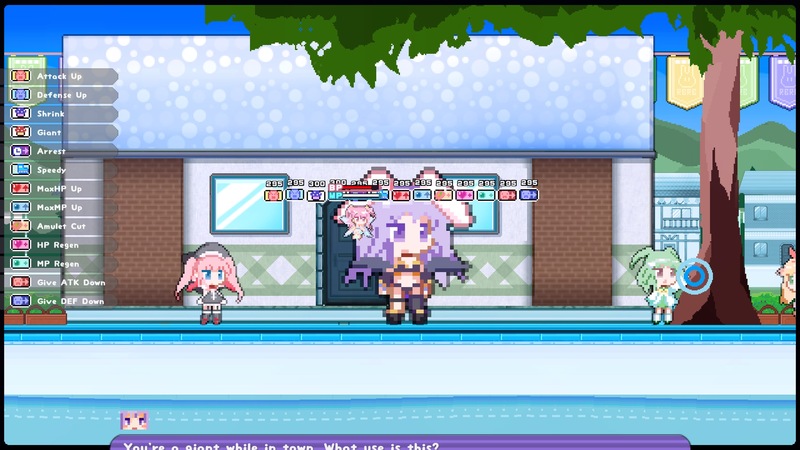 As a bunny that’s been magically transformed into a fairy-wielding hero with a hammer to match, it’s up to Erina to rescue her former master and bring peace back to Rabi-Ribi Island. Rabi-Ribi might be filled with cute girls with bunny ears or swimwear, but don’t let the looks deceive you. Hidden beneath the colorful array of anthropomorphic ladies lies one of the more unique approaches to the Metrovania genre in quite some time. If it weren’t for the simple level-up system or currency to purchase new upgrades and abilities, I would put it much closer in line with Metroid with functional melee and combo mechanics to match. All across the Rabi-Ribi Island are hidden secrets just waiting to be unearthed. Something as simple as a slightly higher jump ability can unlock entire new areas with additional secrets and bosses within. Many times, Erina is given little guidance on where to go, save for a map marker that hints to some far off objective but no path to reach that goal. It’s something recent Metroid games have attempted to give the player a vague sense of direction. My one complaint with the mapping system is that if you receive a side quest or main objective, that map marker and accompanying hint cover up a large section of the map, making trying to read what’s underneath quite difficult if you’re not immediately familiar with the area. A Metroidvania game is frequently judged upon how well and evenly spaced out new ability upgrades are conferred upon the player. In Rabi-Ribi, there’s barely any downtime between new upgrades and even simple power boosts like health and attack increases can be found in great volume if the player takes time to explore off the beaten path and throw carrot bombs at every suspicious rocket they come across. In most other games in the genre of Metroid, gathering up more and more artifacts and upgrades gives your character the feeling of becoming a badass that can trivialize the rest of the game; not so in Rabi-Ribi. As Erina gains new badges and abilities, the bosses she goes up against grow in level. It’s surprisingly easier to defeat most of the bosses with fewer tools in Erina’s arsenal, but just trying to get to them without the required upgrades is a challenge all its own. 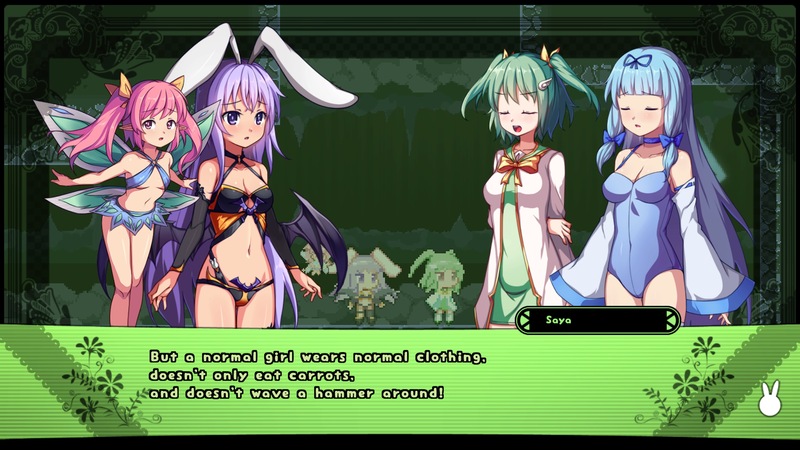 If you’re looking for a far greater challenge than what Rabi-Ribi expects of the player, sequence breaking is part of the player’s toolset from the very beginning if they know what they’re doing. For those not in the know, sequence breaking is deviating from the suggested order of abilities in a Metroid-style game. Typically huge swathes of the world are locked away until double jump is unlocked with more traversal abilities guiding the player to areas previously just out of reach. I stumbled upon one of these by pure accident when attempting to pull off a wall jump long before I had unlocked the required ability. It’s a much more complex input of commands to jump up and kick off of a wall, something I could only manage one out of every ten or so attempts, but I was able to unlock a much more powerful carrot bomb ability hours before the game pointed me in that direction. There are even challenges associated with breaking the game and finishing with almost no items acquired. 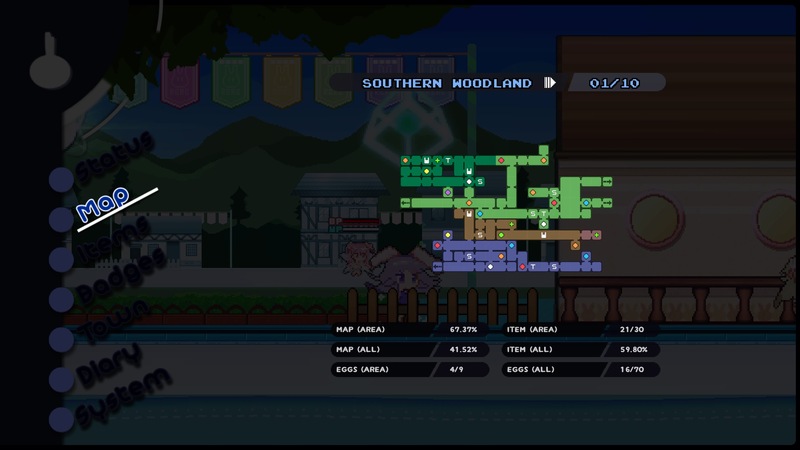 The other major challenge to Rabi-Ribi lies in its unique strength: the bullet hell attacks. Rabi-Ribi requires far greater precision with jumping and sliding than any MegaMan game that’s come before it while needing the same level of pattern memorization. Just about every boss’ attack can be dodged with ease as you learn to master the bullet patterns, but it’s taking the time to learn these attacks that can cause the more casual gamer frustration. Who knows how many times I’ve hit a game over screen against the same boss, just because I couldn’t get a read on some of their later attacks. 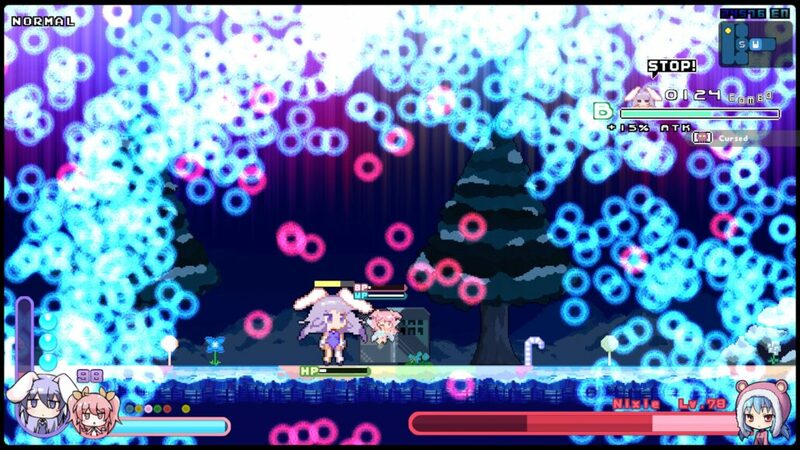 Rabi-Ribi does try to soften the blow of repeated failures by giving the player a temporary halo buff that grows in intensity the more players die, so there’s thankfully an option if you’re getting stuck on the same fight. Rabi-Ribi is one of those rare indie titles that should be part of the criterion of Metroidvania adventures. If you have a PlayStation 4 (or Vita or PC), you owe it to yourself to check out the single greatest title in the genre since Cave Story. The higher difficulty in boss fights might turn away the more casual audience, but perseverance certainly pays off in Rabi-Ribi! Review code provided by the publisher. You can buy it via Amazon. Although the bullet hell action can be too intense at times, those that persevere and see Erina's adventure to the end will be rewarded with one of the best titles in the genre.